The possibilities are endless once you start looking at individual processes. You really start to question why you have previously implemented solution specific systems when workflows and apps can do the same job without the added expense. You are really only limited by your organisation's ability to develop apps and flows. We have a high contractor population in technology so building an in-house capability is somewhat restricted. It's well suited for complex applications in health, banking industries, legal departments that deal with repeatable complex business problems and it allows/provide those authority to case workers to resolve these issues. And I feel IBM Case Manager might not be suitable for organization who deal with less complex problems that can be easily resolved by other business process products. Appian allows us to link systems together with data being automatically obtained from different areas of different databases. This has removed the requirement for the user to go to a screen and manually input data which then needs to be re-checked by a Supervisor. Appian enables us to react quickly to an ever changing regulatory environment. The re-useable components within Appian enable us to build and deploy new, straightforward, processes quickly. IBM Case Manager provide case builder to build customer solution that create your case types, workflows, relevant document types that connect with cases, and capability of authorizing people to access through different roles. IBM Case Manager provides lot extensive case REST API which allows applications to integrate with IBM Case Manager and Content Engine. IBM Case Manager comes with one of the admin client tool which is very easy for an administrator to manage the solution deployments. We haven't found the on-premise upgrade process straightforward. The versions seem to change fairly significantly and the installation guide isn't a good as it could be. Appian doesn't seem as resilient as other applications. For example, a VMware server recently had a failure and automatically failed over to a secondary. Every application running on the server recovered without intervention, but Appian didn't and was unavailable for around 2 hours whilst we worked with Appian support to diagnose and fix the issue. I think anyone should be able to use the product. It doesn't take a programmer to use it even though I am a programmer and it did help me to understand things quickly, it isn't a requirement and most people who are able to understand basic workflow concepts can pick up the product easily. 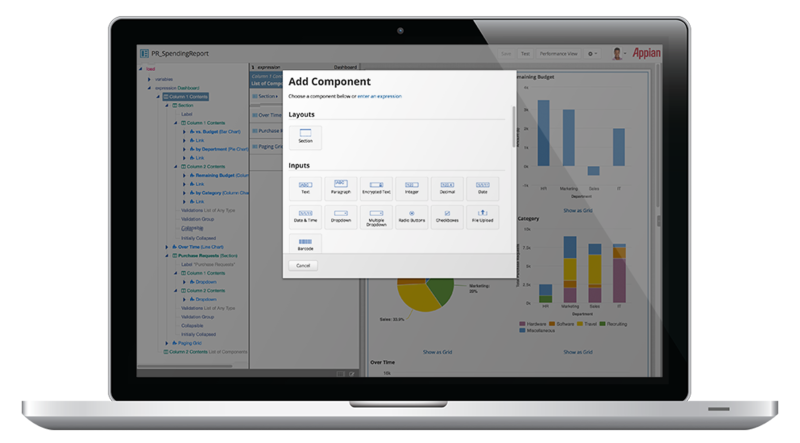 When evaluating Appian we were asked to compare it to other enterprise tools we currently use such as Atlassian's JIRA and Rally. It is really impossible to compare the two for the simple fact that within Appian you can build the workflows and data capture mechanisms that each of these tools offer. The difference is that with Appian you can customize the workflows to an infinite degree whereas with an off the shelf application you are relatively limited to what the developer provides. IBM Case manager suites comes with bunch of underlying products, 1. Content Platform Engine, 2. IBM Content Navigator which provide rich user interface and room for customization's, 3. IBM Case Manager admin client, Case builder 4. Extensive Case Manager Rest API 5. User friendly configuration tool for configuring case manager environment and many more. And we feel this is one of the leading product that provides shared service platform. We were not able to implement all of the projects we had going before our company was bought out by another competing company. The new company decided to abandon Appian even though it was a good tool. That being said, I was able to roll out three of the projects that I was working on even though they were not used by the company due to the selling of our company. We have been seeing organizations who implemented ICM had faster processing of their transactions.